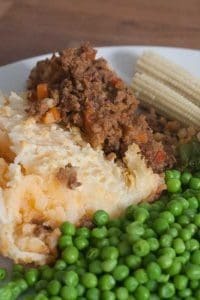 A Delicious make-ahead recipe that can be frozen for Mediterranean Shepherd's Pie perfect to make in batch and use for easy mid-week family meals. Start off by chopping the onion and mushrooms. Tailor how many and the thickness to your taste, we prepare for our children to eat so I make sure that the pieces aren't too big. If you are using fresh Mediterranean Vegetables then chop these as well. Heat up some oil in a large pan and add in the onion, mushrooms and any Mediterranean vegetables and brown for around 5 minutes. Add the lamb mince to the mix and stir as it cooks. Once the lamb has browned, crumble in the stock cube, add the sun dried tomatoes and tomato puree. Mix well and let simmer. With the potatoes cooked, drain and add a knob of butter and mash. Depending on the potatoes you may need to add some milk or cream to make the mashing easier. I have found that the best way to freeze the Shepherd's Pie is in 2 parts - the minced meat in one container and the mash in another, this is because sometimes we will use the minced meat in other dishes. On the day you want to serve the Shepherd's Pie take out the containers in the morning and defrost. Add the Mince to a heat proof dish and then top with the mash. Spread the mash over the minced meat with a fork leaving lines that will crust nicely when cooked. If you want, you can add some cheese to the top and place in the oven to cook at 200C for 30 minutes until the top is lightly browned and it's cooked all the way through. With 1kg of lamb mince we usually have enough for 3 pies for the family (would serve 6 people as the kids don't eat a lot).